Noah was a hyperactive child. Noah’s parents had been working with him for some years, and after a tremendous amount of trial and error, they discovered that when Noah stayed away from refined sugar, he was quite normal, but as soon as he ate anything that had the smallest amount, he would go crazy. Recently they had a powerful reminder of this. It was during an Easter party that Noah slipped away from his grandmother, who was watching him, and gobbled a few chocolate eggs. A short time later, Noah jumped onto a table and began spinning wildly and yelling at the top of his lungs–much to the shock of other party-goers. Noah was smaller than most kids his age, but he was exceptionally active and bright. Several doctors they had taken him to had offered drugs such as Ritalin, which is a “mild” central nervous system stimulant, according to the Physicians Desk Reference (PDR), 43rd ed., 1989. This didn’t seem to help much. In fact, Noah seemed to get more nervous and anxious, and began to lose his appetite while on the drug. Noah’s parents experimented with many other ways to maintain a balance in his system and avoid symptoms of hyperactivity and his occasional problem with holding his attention in school. The following is what they learned. It is interesting to review current allopathic medical thinking on the condition, in order to understand some of the ways in which our society considers this condition, as well as ways it is likely to be viewed when a child is taken to a medical doctor. Other holistic therapies will follow. 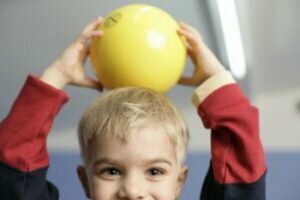 According to the PDR, pathological hyperactivity in kids is sometimes called Attention Deficit Disorder, Hyperkinetic Child Syndrome, or Minor Cerebral Dysfunction. Although the PDR recommends using Ritalin, other factors– psychological, educational, and social–are also mentioned in passing. This disorder is said to be characterized by “the following group of developmentally inappropriate symptoms: moderate-to-severe distractibility, short attention span, hyperactivity, emotional lability, and impulsivity.” Learning disability and inability to concentrate in school or at home might also be present. The syndrome is often diagnosed with the use of an EEG. Many natural health practitioners and herbalists view severe hyperactivity in children as being closely related to emotional and physical nourishment. The child may be starved for affection, attention, or important nutrients that aren’t available in some modern fast-food diets. Considering the prevalence of these kinds of diets in the cities today, it is surprising the problem is not more widespread than it is. Kids are often extremely active and energetic. They have abundant energy, and to the adult eye, it is often undirected and scattered, making it seem more out of control than it actually is. But very young people often have a rhythm and innate sense of their own about the way in which their energy is moving. However, they often do not have the discrimination to know when an activity is excessive. This is where gentle, firm guidance is needed to help the child direct this energy into balanced and healthful channels. For instance, instead of running around and yelling wildly in the house, a good bike ride, skateboard ride, or outdoor game is equally satisfying. However, they often do not have the discrimination to know when an activity is excessive. This is where gentle, firm guidance is needed to help the child direct this energy into balanced and healthful channels. For instance, instead of running around and yelling wildly in the house, a good bike ride, skateboard ride, or outdoor game is equally satisfying. Many parents have discovered that when they are really with their kids and offer them the close and frequent contact they need, both physically and mentally, hyperactivity is less of a problem. It's easy to say cut the sugar, but often not so easy to keep kids away from it. Fortunately, today there are numerous alternatives in natural health stores. I have found that more complex carbohydrate-based sweeteners such as organic brown rice syrup or barley malt are less stimulating. There are a number of commercially-available treats containing these. There are a number of commercially-available treats containing these. Two Herbal sweeteners that really work well are stevia (the sweet herb) and Licorice. To use stevia leaf, simply make a tea (1/2 tsp to a cup of water–let steep for 15 minutes) and add 1/8 cup to a small amount of barley malt or brown rice syrup to enhance the sweet flavor. This combination helps mask stevia’s slightly bitter flavor. Stevia tastes sweet, but it will not stimulate the metabolism. The American Herbal Products Association (AHPA), the herb industry’s trade association has recently submitted a petition to FDA, requesting that stevia be granted “Generally Recognized As Safe (GRAS) status, allowing it to be used freely in various products for consumption. If you would like to support this effort, you can write to your congresspeople, the White House and the FDA, requesting that stevia be recognized as safe to trade without restriction. Alternative treats for hyperactive children Instead of soft drinks (many of which are loaded with sugar) or bottled fruit juices, which contains a considerable amount of fructose, there are a number of delicious Herbal Teas that can be sweetened with stevia or Licorice. Herbal teas such as Camomile, Peppermint, Spearmint, Orange peel, Cinnamon and hibiscus sweetened with stevia or Licorice. Another Calming food: Celery and lettuce have a calming effect on the nerves–try Celery stuffed with nut butter, etc. Here are Herbs that many herbalists recommend for hyperactivity, all of which are widely available in natural food stores as single Herbs or included in formulas. Herbs are generally purchased in Bulk to make teas, or as finished products like capsules, tablets or liquid extracts. I have found that liquid extracts are especially useful for children because they can be disguised in tea or juice. The dose can easily be regulated between 1 or 2 drops up to 40 or 50, which is appropriate for kids, depending on age and size. These liquids work quickly (in 10-20 minutes) compared with powdered herb products, which may take up to an hour. 1. red clover Blossom–an excellent choice in any tea blend, as it is considered a “blood purifier” as well as a gentle nerve relaxant. Would facilitate in cleansing the blood of Toxins/chemicals, while calming and is recommended used over a long period of time. Use as a tea–1 tsp/cup of water; steep 20 minutes, drink 1/2 cup morning and evening. 1. Chamomile–safe, effective, gentle and good-tasting relaxant for children. 2. Lime Blossom–stronger but still a safe, relaxing herb. 3. Valerian–a central nervous system relaxant; excellent as a tea or fresh plant liquid or powdered extract–one of the strongest natural Herbal sedatives, but non-narcotic and not habit-forming. 4. Catnip–another mild sleep aid and relaxing herb, safe for children. 5. California poppy–a safe sedative for children; recommended for hyperactivity and Sleeplessness. 6. Wild lettuce–safe and mild sleep aid and sedative; usually mixed with other Herbs. 7. Lemon Balm–Lemon-tasting herb which has a mild relaxing effect. 8. Hyperactivity is a form of stress, and the child should also be treated with Avena (wild oats), a nervine tonic and nutritive, and Vitamin C and B-Complex Vitamins. Note: Parents can also benefit from the above as well since they would also be under stress with a hyperactive child. **Make sure to add lots of sea vegetation to the diet–a great way to ensure the child is getting adequate mineral ions which is essential for proper nerve function. **Try giving a child an Herbal bath or foot soak–this is a traditional way of relaxing–add either a tea of Lavender blossoms or one of the other sedative Herbs, such as Lime Blossom (Linden). ** Yoga exercises for children can help relax and center. *Massage, acupoints–kids love to be touched. Traditional Chinese Medicine views hyperactivity as a result of a hot liver. Holly Eagle, OMD, CA of Ancient Roots Medical, located in Santa Cruz, CA., says that in her experience working with hyperactive children she has noticed that a diet which is too acidic contributes to irritability and agitation in children. In addition, Dr. Eagle says there is a tendency toward excitability when growth hormone is more active, for instance during periods of growth spurts. Irritations to a child’s system, such as new teeth are coming in, etc. can be a factor. She feels that children who have problems with sweets tend to be restless at night. The Japanese call hyperactivity the ‘Sweet Bug’ disease, and it is associated with symptoms of itchy, restless feelings, and Sleeplessness at night. Dr. Eagle says that touching the child with a light touch is very helpful and effective during times of hyperactivity, and this includes before bed to help induce a better sleep. She also recommends cooling the liver fire with the Chinese Herbal patent formula ‘Hsiao Yao Wan’ – Bupleurum Sedative Pills. This famous Chinese patent remedy is widely available in herb stores. Give the child about 6-8 of the small Black pills 3 times daily for a few weeks. The importance of a good diet cannot be over stressed. BrightSpark is a natural, safe and proven complex homeopathic remedy, clinically formulated to treat the symptoms of ADD (Attention Deficit Disorder) and ADHD (Attention Deficit Hyperactivity Disorder) without the side effects of prescription drugs such as Ritalin, Concerta and Adderall. BrightSpark has been specially formulated for children under 12 years of age to help then to relax and calm down; be less impulsive; listen more carefully; follow instructions; concentrate better; be less distractable; achieve better results at school or work. Adults and teenagers with ADD should use Focus ADDult herbal formula. Formulated by our team of experts in natural medicine, BrightSpark is recommended for use with Focus Formula and is pharmaceutically manufactured to the highest standards. Learn more about BrightSpark now.